Dibrugarh, SJS Vestition 2018: On 28 May 2018, 6 of our Brothers received the cassock during a Concelebrated Eucharist presided over by Rt. Rev. Joseph Aind Sdb. It was a very well organized and touching ceremony at by St. Joseph’s Minor Seminary, Dibrugarh. It was attended by some of the priests of the Diocese of Dibrugarh. The Seminarians animated the liturgy. 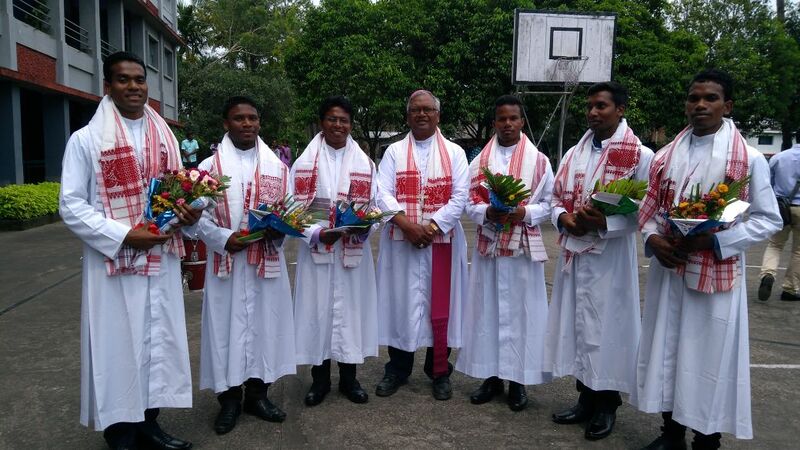 The Bishop encouraged the six young brothers and for their daring decision to follow the Lord as priests to work in His vineyard in the Diocese of Dibrugarh. It was a very proud moment for the Diocese of Dibrugarh as the Brothers came forward and received the cassock. It was an occasion to rejoice as the Lord is choosing young men to answer his call to priesthood to work for His people. It was a reminder to encourage more vocations to priesthood and follow them up in their years of formation. It is a long journey on the way to the priesthood for these young Brothers, and they look happy and confident to make it to the altar of the Lord.